The MMC Console system-tray icon indicates whether or not the MMC Console is connected to the Mailtraq Service. It also gives access to the Mailtraq Monitor tools. If the system-tray icon is not displayed when expected you may run the Mailtraq Monitor program from Windows Start | Programs. Mailtraq uses a Windows MMC service snap-in control. 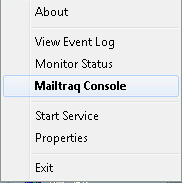 The Mailtraq Console is normally accessed by right-clicking the Mailtraq icon in the System Tray, by the clock, and select 'Mailtraq Console'. Run the Mailtraq Monitor program after installation if the management console icon does not automatically appear. You may also access the Mailtraq Console from the Windows Start Menu as shown in the above illustration. The MMC Console can also be used on NT/XP/2003 machines for general administration in place of the Traditional Console in Mailtraq 2.16 and above. Always be sure to have a full and valid backup of your database folder before upgrading. Download the WiX/MMC version of Mailtraq from the Latest Releases page. 1.) Close the Mailtraq Console if it is open. 2.) Use the Monitor icon (right-click) to 'Stop Service'. Allow the service to stop (there may be transactions in progress). You will see the icon change from a 'green arrow' to a 'red bar'. 4.) Run the MMC/WiX setup download. Shut down the Mailtraq Service (if it is still running). Take a copy of the Mailtraq Database folder as a safe-guard. All configuration and data is retained during the uninstall/install process.